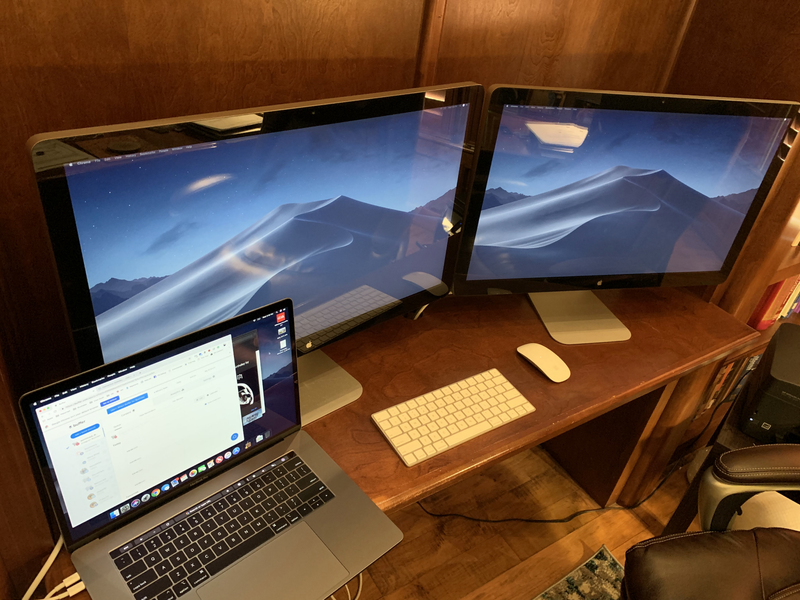 Question: Is it possible to use a single USB-C to Thunderbolt 2 adapter to accomplish a three-screen set-up? Answer: Yes! With this adapter by Apple you can run the MacBook screen plus 2 monitors, however, you cannot charge through the same port so plan on occupying two USB-C ports to accomplish charging as well as dual monitors. Purpose: Prior to purchasing a 2018 MacBook Pro 15-inch, I couldn’t find anything online regarding daisy chaining my two 27" 4K Apple Retina screens. Hopefully, this will be indexed and help others who are in the market for new technology that needs to mesh with slightly older technology.